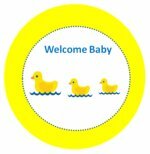 How to Throw a Duck Baby Shower? 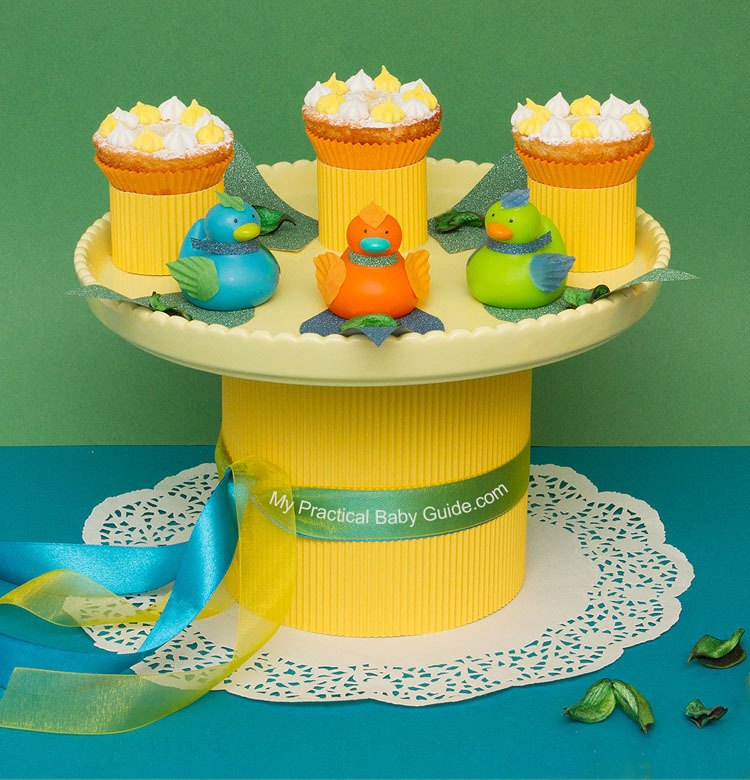 A duck baby shower is a festive, gender-neutral theme. 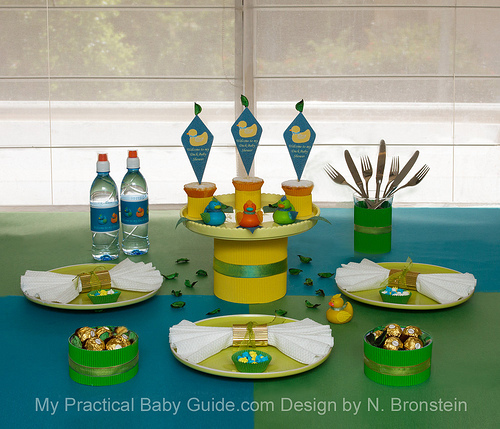 After doing some research on the internet I found that a duck baby shower theme is one of the most popular choices. 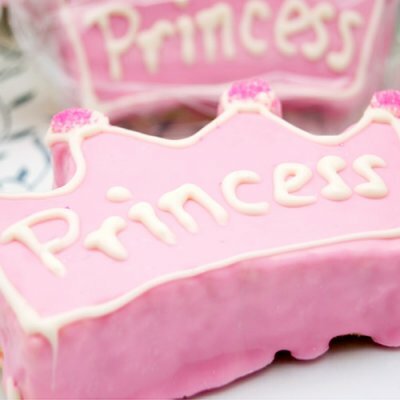 I discovered a lot of ready made themed items such as decorations, invitations and favors that can save you a lot of time and, of course, money by shopping online. Invitations decorated with ducks are suitable for both baby boys and baby girls. You have four options when selecting the shower invitations and your choice will most likely be dictated by your budget. Fully customized invitations - These cost a couple of dollars each so for large showers, they can get quite expensive. Duck themed invitations - These come blank, decorated only with duck motifs. You can fill in the shower details by hand or by printer. DIY invitations - These can be either expensive or inexpensive. If you are creative and ready to invest time and money, the choices are endless. You can choose your own quality paper, make your own envelopes, create your own design and add interesting decorations. Email invitations - These are the cheapest but lack a personal touch and may not be welcome by some guests, so use your own judgment before sending them. Rub A Dub Dub, A Baby Boy To Love (or girl) - this is great for a Ducky baby shower cake or a baby in a bathtub cake. 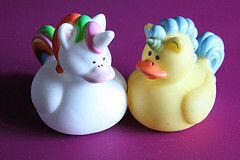 Rubber ducky, you're the one, Who makes bath time tons of fun! Swim on over for Mary's Baby Shower Celebration. Isn't Samantha lucky? Having a baby is just ducky! Little ducks, fuzzy and yellow, is the theme we've chosen to welcome a special fellow. She's having a boy/girl, isn't that lucky? We all think boys/girls are ducky! Rub-a-dub-dub, soon there will be a new duck in the tub! A baby duck is on the way, join us to celebrate before the big day. A splash of water and hint of color, we're celebrating baby with a rubber duck shower. If you use folded card invitations, you will have plenty of room for longer rhymes and for the shower details as well. The little rubber ducky He is so cute and fluffy And we're using him to celebrate A little baby warm and cuddly. The duck will be the main theme Everything will be yellow and blue And bring a gift along for mom But most of all, bring you. Start by choosing the color scheme and color combination. If you prefer traditional colors, use yellow and pink for a girl and yellow and blue for a boy. If you don't know the gender of the baby, you can always use yellow and green or yellow and orange. Whatever colors you choose, make sure that you stick to those colors in the general decorations. Decorate the entrance door with yellow balloons and duck themed banner. You can even use a themed yard sign in the garden. Decorate your walls with Rubber Ducky Felt Cutout Assortment or Rubber Ducky Felt Jointed Banner. Choose a table cloth that will complements the decorative items that you have chosen. Sprinkle this assortment of yellow duckies and set the table with the appropriate number of duck-themed plates, utensils, cups and napkins. Purchase actual rubber ducks and place one in front of each plate as a party favor. For a duck themed centerpiece, use transparent glass bowls filled with blue dyed water and floating rubber ducks or floating duck candles. To dye the water in blue, use food coloring, and to get a bubble effect, use tiny clear plastic balls or gelatin like crystals which are available at craft stores. You can use yellow flower as a centerpiece too. The best flowers to use with this theme are babies breath, daisies, lilies, or sunflowers. 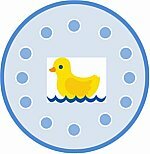 Here are free printable cupcake toppers that you can use to decorate a cupcake for a duck baby shower. All of these printable cupcake toppers are free and easy to download. 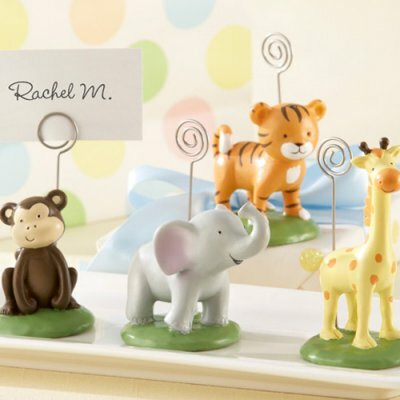 Looking for more Cupcake Toppers visit our cupcake toppers page. 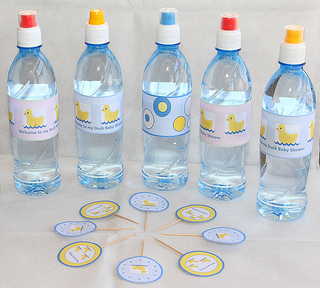 Here are free printable custom bottle label that you can use to decorate a bottle for a duck baby shower. All of these printable custom bottle labels are free and easy to download. If you are interested on how to create custom bottle label visit my blog. Hot rubber ducky is a variation of Hot Potato. While the music is playing, guests must pass around a rubber ducky toy. When the music stops, the guest holding the rubber ducky is eliminated from the game. Buy rubber duckies. Give one rubber ducky to each guest and ask them to line up on their knees at the end of a baby pool full of water. When you say start, each guest places her rubber ducky in the water and blows at her duck trying to be the first "mommy" to guide her "baby" to victory. Hide a number of rubber duckies around the house equal to the number of guests. Write a number on the bottom of every duck. Write the numbers on a paper and specify a prize to each number. Tell your guests to search the house until they find a rubber ducky. Each guest can only get one duck. The guests can trade rubber duckies throughout the party or keep the one they found. At the end of the party, give out prizes based on the number on the bottom of each rubber ducky. Buy rubber duckies, write a number under each duck (use permanent marker), and place them in a large baby tub filled with water. Give each of your guests a piece of paper with a number (the number of the duckies must be equal to numbers you give to your guests). Ask the mommy to be to draw out rubber duckies and call the number written on each. The last rubber ducky that she draws out the tub will win a prize for the guest. Prepare a rubber duck and a plastic cup for each guest. A day before the shower, put a duck in every plastic cup and fill with water until the duck is covered. Place the cups in the freezer until frozen. Give each of your guests one cup and whoever melts the water first, or their water breaks, gets the prize. Let your guests be creative and find ways to melt the ice. This is my favorite game since each guest can play the game no matter what age or physical limitation they may have. Tip : Tell your guest they can't use the microwave! Give each of your guest a pen and paper. Set the timer for three minutes and ask your guests to write as many names of ducks they can think of. For example:Daisey Duck,Quacker from Tom and Jerry, Duckman,The Ugly Duckling, Donald Duck, The mighty ducks, Howard the duck, Daffy Duck, the Aflac Duck,The Mighty Ducks, and my favorite Long Duck Dong from sixteen candles. The player who named the most Ducks is the winner. 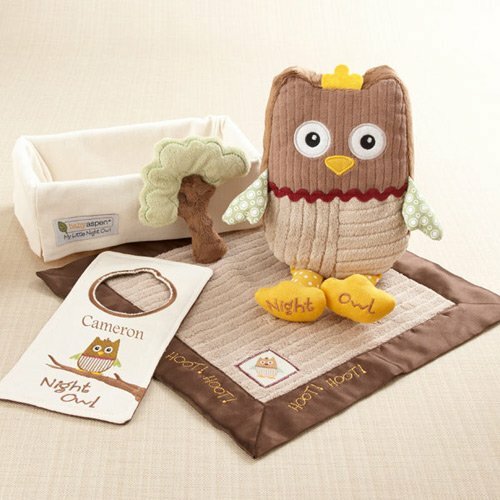 Tape pictures of different baby-related items such as a baby bottle, rattle or diaper on the bottoms of the ducks. Set the ducks on a flat surface. Hold up each duck one at a time and show the guests what's on the bottom. Ask the guests to write down what was on the bottoms of the ducks in the order they were shown. The person with the most correct answers wins the game. Buy a little rubber ducky for each of the shower guests. Fill a bath tub or any plastic tub with water. WIth a permanent marker write 'Lucky Duck' on the bottom of one of the ducks and then place all of them in the pool of water. Have each guest choose a duck during the shower. The 'lucky duck' wins a prize.